A week ago I was out of control, eating every time I passed the fridge... or so it seemed. For a week I've eaten 3 times a day, I recorded my food and averaged 325 calories a day less than what the iphone program Lose It claimed I needed to eat to lose 1.5 lbs per week. Result for 8 days: lost 3 lbs. Yea! Only 13 3/4 lbs. to go. 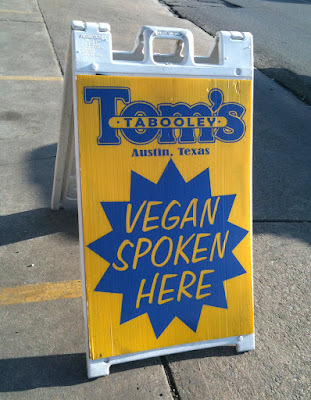 "Vegan spoken here" might seem unnecessary. At another restaurant, a vegan friend ordered vegan quinoa and had to leave it when he discovered it was loaded with cheese. Wise teacher doesn't see elephant?